Out of all the characters introduced, only a selected few would shine out from the entire cast. Names like Optimus Prime, Megatron, Soundwave and Starscream became legends. One of the most fleshed out characters in the cartoon was none other than Starscream. Toy-wise, Starscream shared a mould with no less than five other Decepticons, something that didn't happen with any Autobots or other allies of his. Whilst "evil" (in the cartoony sense, anyway), his mould brothers always stayed loyal to their leader, Megatron. Skywarp and Thundercracker usually got snazzy one-liners, while Ramjet, Dirge and Thrust barely grunted. The writers decided to take Starscream to a whole different level. He embodies "traits" of villainy, treachery and ambition unlike any other Decepticon. Perhaps being so different was what made this character so iconic, so unforgettable through the years. After starring in two full seasons of the G1 cartoon, Starscream eventually became leader of the Decepticons after abandonning Megatron for dead. His leadership was short-lived, though, as he was killed by Galvatron mere seconds after he was crowned. That marked the end of Starscream in the animated film, although he returned twice in Season 3 as a ghost. Possessing the bodies of Scourge and Cyclonus, he attempted to kill Galvatron and become leader once again. In doing so, he even struck a deal with Unicron, who he didn't think twice of betraying once he got his original body back. Unfortunately for him, an explosion forced him on a course to oblivion, never to be seen again. Yes, the writing was that bad. To my knowledge, Starscream didn't star in any Japanese cartoon series that came after G1, but he made a few appearances in mangas. He possessed the merged bodies of Megatron and Convoy and emerged as Guiltor, a transformer that unsuccessfully tried to destroy Rodimus Convoy and Galvatron. After they decimated him, Starscream's ghost flew off. His comic appearances are quite different, and seeing as I never read any G1\G2 comics, I can't really comment on that. All I know is that he did die, because of the Underbase (an artifact? a killing weapon? sorry...) and returned in G2, only to betray Megatron once again. The next show appearance was in 1996, in the first season of Beast Wars. Traveling back in time as a ghost, Starscream possessed Waspinator and attempted to enslave the Maximals and rule out yet another Megatron. Only this time, his reign was ended by Blackarachnia, sending his ghost drifting away in space once again. It is later referenced that his spark was an immortal one, unable to be destroyed. More recent incarnations include a BW II Starscream (nothing like the original), and two Starscreams in the Micron Legend-Superlink and Galaxy Force continuity. ML\SL Starscream was portrayed as a younger version of the original, eager to impress and please Megatron rather than overthrow him. He eventually gained Megatron's respect and he chose him as his most trusted warrior. GF Starscream is much closer to the original, a villainous and scheming character that not only succeeded in leading his own rogue Decepticons, but also had the best episode of the series dedicated to him. His own struggle against impossible odds at episode 26 really put a more "human" and "kind" touch on his evil character. Except for his BW toys, all his incarnations have been jets. The G1 mould has been re-issued several times in many different variations, whilst his latest incarnations are still available for purchase at online stores and on e-bay for reasonable prices. It's only logical that such an enduring character in the mythos would get a release in the masterpiece line. Unable to cram a jet into the 1/24 scale Binaltech line, they instead incorporated him to the masterpiece line, free of worry about the scale of the figure. Starscream follows the trend laid down by his predecessors in the line and comes packaged in a very attractive black box. In addition to all the things Convoy's box advertised, Starscream's has a "Designer's operation-Shoji Kawamori" block right above Starscream's name. The front of a box has a glossy, almost 3D rendition of Starscream in both robot and vehicle mode. It should be noted that both modes are pictured using the stickers, and are of a much lighter colour than what's inside the box. 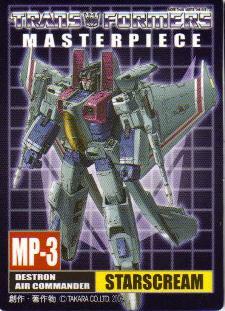 Both sides have the masterpiece logo along with the boxes designating Starscream's number in the series as well as his function as a Destron. Shots of the figure in all modes, accessories shown in the box and various highlights of the figure are shown prominently in white-framed windows on the back of the box, along with a picture of the toy's designed, Shoji-san. Starscream's scale is revealed by looking at one of the captions with Dr. Archeville featured in it-it's 1/60, making him scale-displayable along the Perfect Grade line of Bandai. He also fits with the 1/60 valkyries from Yamato. On a final note, on the bottom of the box has cells of the rest of the Masterpiece line, which, at the moment of the release, featured three other figures, two of which are Convoys and the other is a repaint. That's the only unattractive thing about the whole packaging, in my opinion. Following the design of Convoy's booklet but at the same time radically different, SS's booklet features a stunning cover with an amazing artwork of the figure, sandwiched between shots of the toy in airplane mode. The very first page mimics a BT booklet, with lots of illegible text (at least for me, due to the language it's printed in), coupled with a picture of the figure in robot mode as well as angled shots of the same mode, all the while the jet mode adorns the background. The gimmicks of the figure are displayed next to corresponding images from the first two seasons of the cartoon, and it wouldn't really be a masterpiece figure if it didn't showcase the amazing amount of detail of the jet mode. The transformation sequence is thoroughly illustrated in the next pages (admittedly, it's not as easy as Convoy's due to the biggest number of parts that need to be moved around), but that will be covered in the following sections of the review. The story of Starscream (well, sort of) is shown in the last few pages, with pictures and text accompanying it. It mentions Starscream's interaction with Dr Archeville, King Arthur (why...why...why? ), the creation of Bruticus and his friendship with Skyfire. Honourable mention goes to his role in Beast Wars, as well as the few appearances he made in season 3, but those are without a picture. The next page is chock-full of pictures of all the Starscream toys since 1985. Included is G1, Pretender, Action Master, Machine Wars, BW II, BW II Cyberbeast, Micron Legends, Superlink, Superlink V2, Robot Masters, GF and Cybertron. I find it interesting that it clearly covers american series as well (Machine Wars, the American oversized Cybertron version) but not Energon Energon Starscream. Probably the aforementioned toys (mainly Machine Wars) was also released in Japan? To sum the booklet up is an interview with Shoji Kawamori. The translated version can be found at major transformers fan sites. For those who are unaware of who he is, Shoji Kawamori is the man behind Macross (or Robotech, if you prefer). Ever since the early eighties, this man has been designing transforming airplanes and writing stories about them. The original sketch is also depicted, showing the differences between this figure and the first prototype. Finally, a character card and a sticker sheet are included. The stats are probably not corrected, as SS is clustered with a sum of 7, 8 and a 5. For those who are unaware, his stats were mixed with Skywarp's in G1 and it seems that even today that's the case. 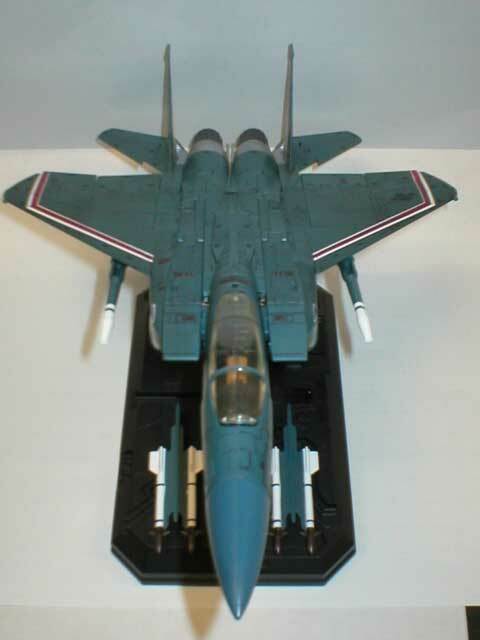 Starscream debuts in his MP form as an F-15 model, quite probably in a low visibility colour scheme. I'm not really an expert on planes, so I'll just avoid any comparisons to the real life model. The one thing I'm certain about is that MP Starscream "cheats" by having two Gatling guns installed (the white triangle things to the side of the air intakes) while the real life model has only one. When it comes to detail, Starscream makes MP Convoy look like a Cybertron scout. The entire surface of the jet is full of intricate panel lines (the only other transformer figure I have that matches this is Classics Jetfire) including vents, bolts and the likes. The thrusters on the back and the air intakes both have details moulded onto them and a detailed cockpit rounds Starscream up. Starscream only features one pilot seat but there's room for a second one; installing another would only hinder the transformation process. Overall, Starscream gets 10 full marks for the sculpting alone. A lot of fans moaned when the first pictures of a coloured sample figure emerged. 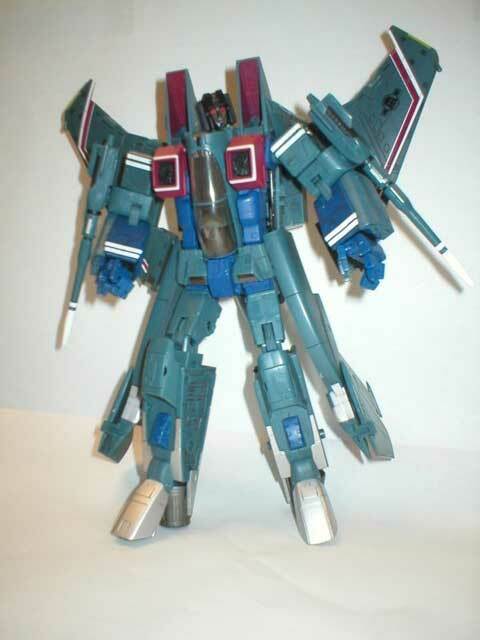 Completely show-inaccurate, Starscream comes moulded in a dark green-bordering on obscure gray- colour scheme. Many would have preferred Starscream in his traditional gray and red paintjob, but designer Shouji Kawamori felt that it was not a pattern that's used on real jets. The guy may design mechas like a god, but his reasoning when picking colours for his designs are at best, poor. His previous work, the VF0 from Macross, turned from blue to gray on the figure because the blue in the anime was the weathered look. Moving on, Starscream actually looks good in this colour scheme. Due to the overall dark tone, he fits in with the four Decepticon Binaltechs like a charm. What's more, the entire figure is panel-lined and marked from the get-go! Small "caution" insignias, black Decepticon logos, "no step" and even Starscream's motto are all accurately painted on the figure. Yellow is found on the tailfins and on the edge of the wings and red with white are painted on the wings in the form of stripes. The null ray cannons have their tips painted white and fine detailing done with black. Following the steps of MP Convoy, Starscream has some rather nice gimmicks in this mode. The wing flaps can be rotated up and down as well as the rear fins, a panel opens in the main body revealing a chrome pseudo-suspension, the panels right before the turbines open up to expose mechanical details and the nosecone of the jet can be swung out and to the side for a good look at the radar of the jet. Finally, the landing gears can be opened and deployed and actually hold Starscream pretty well since they're made of die-cast metal. Starscream looks pretty good in this mode and will probably get a lot of admirers in the form of visitors or friends coming by. At 1/60 scale, he measures 34 centimetres from nosecone to tailfins and has a wingspan of around 21 centimetres. Following a not so well thought-out transformation, Starscream emerges from a fantastic jet to an even better looking robot. The transformation features one of those "perfect change" methods, where no parts except for perhaps the weapons are removed to make the figure change modes. The transformation leaves you at one point with one too many parts just hanging loose and at points you feel as if you might break the figure. The trickiest part is to form his back (formed of the back panel and wings) and get his head past the main panel of the jet mode. The legs and arms are pretty easy to unfold. Starscream keeps his new green colour in this mode but gets new colours as well; white is found in the form of stripes on the shoulders, chest and wrists, a very dark tone of red is present on the chest and the air intakes. Black is used for the helmet and gray for his face, followed by navy blue for his ribs, part of the legs and part of the arms. Overall, the colours form a very nice dark endeavor that gives Starscream a dark vibe. While they may not sit well with the fans, the colours work well for the robot mode. Articulation is pleasing at best, average at worst. His ankles have three points of articulation each (I'm also counting the heel) but can't really support many poses. His knees have two points of ratcheted articulation but can't bend beyond 180 degrees because the chunky calves don't allow for that much movement. The leg can rotate below the hip-waist joint and can swivel at all sides (as much as the armour allows) at the part where it connects to the main body. Waist rotation is present but the cockpit and ribs do not allow for full rotation. The arms have 11 points of articulation each. They swing out horizontally and vertically on the shoulder, they rotate just below that part, have double elbow articulation, rotating wrists and articulated fingers. Unlike Convoy's, Starscream's thumb and index figure are the only independent-the other three are clustered together in one mould. Finally, the head rests on a double ball joint that allows for full movement in all directions. A lot of kibble is present on Starscream, but truthfully, only the jet parts at the waist hinder his movement. Since a great part of the rear of the jet becomes movable leg armour, you're given a choice as to how you want to position it. The instruction booklet suggests you have the tailfins to the back of the figure, but this configuration beefs up the upper body mass and makes the legs look skinny in comparison. I prefer to leave them in about the same position they were in jet mode, as it provides bulk for the legs and makes Starscream more symmetrical. Those two armour parts are connected to the top of the leg via a ball joint-they can easily be removed at your discretion. The wings can be displayed in a variety of positions, for example angling upwards (preferred), being one with the main body (only rotate them up for the transformation but don't swing them to the sides) or even angling backwards. I must add that the clip-on joint on the wings is not very strong and they will get disconnected from the back if you angle them backwards, but besides that it will not have any other effect. Lastly, Starscream's gimmicks in this mode include a "full burst mode" via opening up all the panels on his back, a chest panel that swings upwards to reveal painted on missiles (set of six) and last but not least, an interchangeable face. By pulling down his chin and then rotating the gray part, Starscream changes from a serious expression to a cocky, smirking face. It requires some effort (at least on my figure) and the there's a tiny bit of red paint absent from the winking eye on mine. It's not much but it does make a whole lot of difference when compared to other pictures I've seen on the web. Overall, Starscream has a very nice robot mode. Barely reaching 22 centimetres in height, he's not up to Convoy's level but looks relatively in scale with Binaltechs\Alternators. While articulation is not as plentiful as I'd like, he's more of a very fine display piece that has just the right amount to pull off some good poses. MP 03 has a slew of accessories which help improve the overall appeal of the figure. 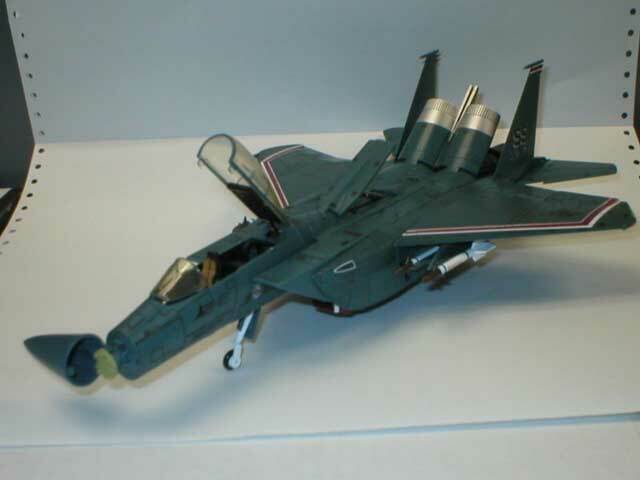 A 1/60 Dr Archevile figure is included in a seated position for SS's cockpit, moulded in the same green tone as Starscream and painted white for his robe. Two sets of well painted missiles can be positioned on his wings or arms in either mode (they're shorter than the null rays, but look good on his back) and a connector piece for the Megatron Gun provided with MP Convoy. The piece is applied below the nosecone in jet mode, housing Megatron in the same manner Starscream and he "combined" in the first appearance of the Dinobots. A finely crafted display base with a plated decepticon logo is the last piece of this set. Cast in black and moulded with the surface of Cybertron in mind, it can house all the accessories Starscream came with. Using the clear manipulator, the figure can be posed very securely in both modes. Overall, Starscream is a very good figure that's worthy of the name Masterpiece. Various factors have made this toy a matter of debate among fans for reasons ranging from his colour to very brittle figures. Stress marks are already showing on the joints on the wings on mine, and that comes from about 10 careful transformations. Other fans report wings or pegs breaking with fewer than that. Due to the fact that the details are painted on with black, transforming or even handling the figure chips those markings away. The motto on mine is almost erased and the white paint on his shoulders is chipping. Since the figure has connection hard points on the head and shoulders, it might be wise to wait for a "Complete Edition" that will possible include a crown, shoulder pads and maybe different colour scheme. Transformation: 10. Unnecessarily complex and not that well thought-out, especially in the wing area. Durability: 7. Markings chipping away is a sign of this, and the stress marks on the wings will only get worse as time goes by. The main robot parts are durable though. Fun: 9. A very, very nice display piece of a favourite character of mine. Jet mode is nicely detailed and looks like a model kit, only without all the hard work. Price: 7. If you can get one for the retail price of about 85 USD, go for it. The figure is out of production and there's no news of a re-issue coming out, so prices have climbed to that of 100+USD. I got mine from Japan for 110 USD shipped. Overall: X. If you want a fantastic display piece to go next to your Convoy and the upcoming Megatron, look no more. If you want a figure you can play with, you're better off with Classics Starscream.